Serra High School is proud to announce the release of two new free apps available through the Apple store! 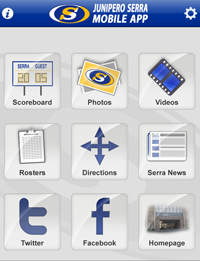 The Serra Athletic Department app is available on both the iPhone and on Android phones. Athletic Director Dean Ayoob '92 developed the state-of-the-art app with Prep Connect Mobile. "It's very exciting to add this great tool for the Serra community to stay connected with Padre Athletics," said Ayoob. Former Padre parent Ben Parodi not only downloaded the app, but provided feedback about the new addition. "Congratulations on the new app....just downloaded it...it is fantastic!" he said. "What a great way to stay in the forefront and relevant. I'm very proud of the Padres. Have a great year and good luck to all of the Padre teams!" Within just minutes of its release, more than 50 people downloaded the new app. To download the athletic app, click here or visit the Apple store and search "Junipero Serra." The app is free and has loads of stats, information, news and directions. 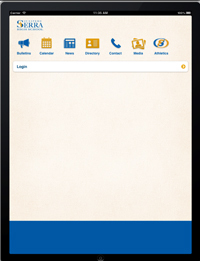 The Serra School app—which will encompass all elements of Padre life— will be released during the next couple of weeks. The app will be available on the iPhone and iPad and will feature daily announcements, calendar events, latest news events, school directory information, photos, vidoes and more! It's all "app-ening" at Serra High School - stay tuned!